Interphase Interphase is the extended period of growth and development between cell divisions. Although little activity can be observed with a light microscope, the cell is quite busy: DNA is being synthesized, RNA and proteins are being produced, and hundreds of biochemical reactions are taking place. By convention, interphase is divided into three phases: Gj, S, and G2 (see Figure 2.9). Interphase begins with Gj (for gap 1). In Gj, the cell grows, and proteins necessary for cell division are synthesized; this phase typically lasts several hours. There is a critical point in the cell cycle, termed the Gj/S checkpoint, in Gj; after this checkpoint has been passed, the cell is committed to divide. Before reaching the Gj/S checkpoint, cells may exit from the active cell cycle in response to regulatory signals and pass into a nondividing phase called G0 (see Figure 2.9), which is a stable state during which cells usually maintain a constant size. They can remain in G0 for an extended period of time, even indefinitely, or they can reenter Gj and the active cell cycle. Many cells never enter G0; rather, they cycle continuously. After Gj, the cell enters the S phase (for DNA synthesis), in which each chromosome duplicates. Although the cell is committed to divide after the Gj/S checkpoint has been passed, DNA synthesis must take place before the cell can proceed to mitosis. If DNA synthesis is blocked (with drugs or by a mutation), the cell will not be able to undergo mitosis. Before S phase, each chromosome is composed of one chro-matid; following S phase, each chromosome is composed of two chromatids. After the S phase, the cell enters G2 (gap 2). In this phase, several additional biochemical events necessary for cell division take place. The important GJM checkpoint is reached in G2; after this checkpoint has been passed, the cell is ready to divide and enters M phase. Although the length of interphase varies from cell type to cell type, a typical dividing mammalian cell spends about 10 hours in Gj, 9 hours in S, and 4 hours in G2 (see Figure 2.9). Throughout interphase, the chromosomes are in a relatively relaxed, but by no means uncoiled, state, and individual chromosomes cannot be seen with the use of a microscope. This condition changes dramatically when interphase draws to a close and the cell enters M phase. Mphase M phase is the part of the cell cycle in which the copies of the cell's chromosomes (sister chromatids) are separated and the cell undergoes division. A critical process in M phase is the separation of sister chromatids to provide a complete set of genetic information for each of the resulting cells. Biologists usually divide M phase into six stages: the five stages of mitosis (prophase, prometaphase, metaphase, anaphase, and telophase) and cytokinesis ( FIGURE 2.10). It's important to keep in mind that M phase is a continuous process, and its separation into these six stages is somewhat artificial. During interphase, the chromosomes are relaxed and are visible only as diffuse chromatin, but they condense dur ing prophase, becoming visible under a light microscope. Each chromosome possesses two chromatids because the chromosome was duplicated in the preceding S phase. The mitotic spindle, an organized array of microtubules that move the chromosomes in mitosis, forms. In animal cells, the spindle grows out from a pair of centrosomes that migrate to opposite sides of the cell. Within each centrosome is a special organelle, the centriole, which is also composed of microtubules. (Higher plant cells do not have centrosomes or centrioles, but they do have mitotic spindles). Disintegration of the nuclear membrane marks the start of prometaphase. Spindle microtubules, which until now have been outside the nucleus, enter the nuclear region. The ends of certain microtubules make contact with the chromosome and anchor to the kinetochore of one of the sister chromatids; a microtubule from the opposite centrosome then attaches to the other sister chromatid, and so each chromosome is anchored to both of the centrosomes. 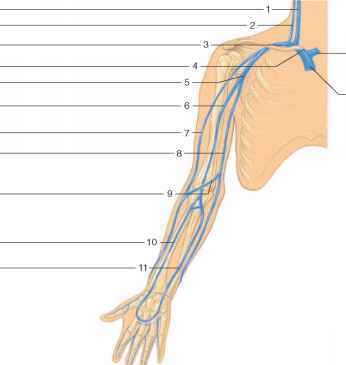 The micro-tubules lengthen and shorten, pushing and pulling the chromosomes about. Some microtubules extend from each centrosome toward the center of the spindle but do not attach to a chromosome. During metaphase, the chromosomes arrange themselves in a single plane, the metaphase plate, between the two centro-somes. The centrosomes, now at opposite ends of the cell with microtubules radiating outward and meeting in the middle of the cell, center at the spindle pole. Anaphase begins when the sister chromatids separate and move toward opposite spindle poles. After the chromatids have separated, each is considered a separate chromosome. Telophase is marked by the arrival of the chromosomes at the spindle poles. The nuclear membrane re-forms around each set of chromosomes, producing two separate nuclei within the cell. The chromosomes relax and lengthen, once again disappearing from view. In many cells, division of the cytoplasm (cytokinesis) is simultaneous with telophase. The major features of the cell cycle are summarized in Table 2.1. The active cell-cycle phases are interphase and M phase. Interphase consists of G, S, and G2. In G,, the cell grows and prepares for cell division; in the S phase, DNA synthesis takes place; in G2, other biochemical events necessary for cell division take place. Some cells enter a quiescent phase called G0. 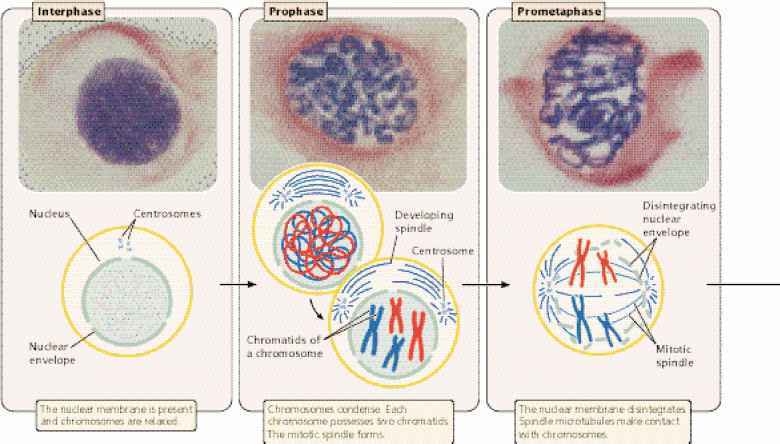 M phase includes mitosis and cytokinesis and is divided into prophase, prometaphase, metaphase, anaphase, and telophase.